A stay at a Phi Phi Long Beach resort gives you the best of many worlds. The glorious beach and coral reef is conveniently close to the main village but still quiet, the views of Phi Phi cliffs are stunning and the choice of bungalows from 2 star to 3 star. The key advantage to a Phi Phi Long Beach resort is the beachfront position. The 350 meter long beach is backed by the jungle covered Phi Phi don hills so all the Phi Phi Long Beach bungalows are squeezed down to the beach area. The Long Beach coral reef spreads all the way from the westerly point at Viking Natures Resort to the inexpensive Phi Phi Hill Resort and is typified by boulder and stag coral. At the eastern end there are 3 rocky outcrops known as Hin Phae and or Shark Point. This description would be enough to entice most but there is more. Phi Phi Long Beach resorts look out onto one of the greatest views in Thailand. The magnificent Tonsai Cliffs that light up every morning, the sunset and the famous Phi Phi Ley so close you feel you can touch it. The Phi Phi Long Beach resort is primarily a locally run bungalow complex. They are characterized by resorts with varying bungalow types. 20 years ago, the resorts built fan bungalows and as time has gone on some of these have been replaced by better quality rooms. The Phi Phi Paradise Pearl has 20 different room types as of 2012. Each room type is priced according to it's position in the resort, it's decor, facilities and finish. The 2 star resort tag is a bit of a misnomer. They vary greatly from depending on whether the owners are referring to their rooms and service quality or their overall appeal, as the views are so exceptional the distinction gets blurred. The Viking Natures Resort, Phi Phi Long Beach Resort and Phi Phi Hill Resort have simple accommodation where fan bungalows are the norm, they are inexpensive and the accommodation basic. 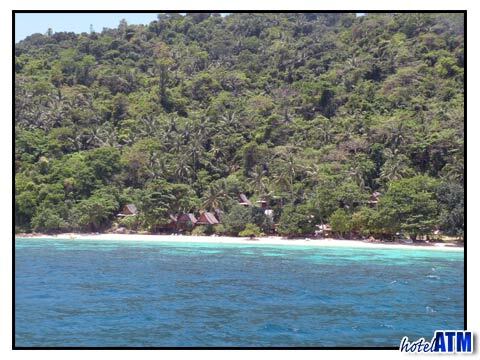 Phi Phi Paradise Pearl and Paradise Resort and PP Blue Sky Resort have pleasing air-conditioned rooms right on the beach or in the case of the PP Blue Sky Resort just 50 meters back. These resorts are more geared to offering a better quality of room. The finest Phi Phi Long Beach resort is the 3 star Phi Phi The Beach Resort. The beachfront resort sits on the side of the hill with bungalow cottages enjoying breath-taking views of the beach and Phi Phi Ley. The deluxe rooms have a pleasing traditional and wooden decor with balconies where you can take in the majesty of the islands and sunsets. The family run Phi Phi Long Beach resort is also typified by varying levels of service. It is important to understand this to manage these into expectations. Phi Phi has an island style rhythm and speed. Life doesn't happen at a pace and for many travellers who do enjoy the Long Beach, it is this 'slowing-things-down' that gives them the holiday experience they are wanting. Long Beach shark point is home of the Black Tip Reef Shark which skim over the shallows at dusk and dawn in search of their prey. The Black Tip Reef Shark are timid but can be seen in the Shark Watch Tour. See also the pretty Long Beach Gallery which gives a great idea of the atmosphere of the beach, the views to expect. The view of Phi Phi Ley is significant. It has one of Phi Phi's best attractions. Maya Bay, Phi Phi Ley is the location where the shot the movie 'The Beach' and this starred the A-listed Leonardo Di Caprio. Phi Phi Long Beach is just 10 minutes away from the main pier at the main Phi Phi Don Village. The main village is home to a great variety of restaurants and bars and enjoys a healthy nightlife. The Longtail Taxi boats go from the pier all day (100 THB per person) and night but prices go up after dark and after midnight. The food experience is better in the main village than in Long Beach resorts as there is more choice.